Like espresso? 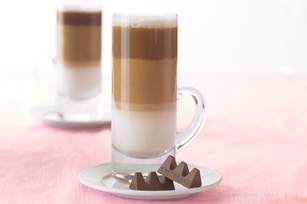 Then you are sure to love this TASSIMO Latte Macchiato, a traditional Italian espresso beverage that is served with a touch of milk. Prepare 1 Milk T DISC from Tassimo Nabob Latte in mug or large heatproof glass. To make a Caramel Macchiato, simply drizzle caramel sauce over prepared drink. Garnish with a light sprinkle of ground cinnamon or grated Baker's Semi-Sweet Chocolate.